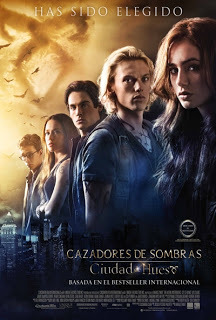 Reparto: Lena Headey (Jocelyn Fray), Lily Collins (Clary Fray), Jonathan Rhys Meyers (Valentine Morgenstern), Kevin Zegers (Alec Lightwood), Robert Sheehan (Simon Lewis), Jamie Campbell Bower (Jace Wayland), Kevin Durand (Emil Pangborn), Jared Harris (Hodge Starkweather), Aidan Turner (Luke Garroway). Guion: I. Marlene King y Jessica Postigo, basado en la novela de Cassandra Clare. Producción: Robert Kulzer, Michael Lynne y Robert Shaye. Diseño de producción: François Séguin. Productoras: Constantin Film Produktion, Sony Pictures Entertainment y Unique Features.